Acrok Blu-ray to Apple TV Converter, the professional blu-ray ripping tool, is good at ripping commercial Blu-ray movies to Apple TV supported file types, so as to help users watching their purchased Blu-ray movies on HDTV via Apple TV, Apple TV 2 and Apple TV 3. It will definitely save you a fortune with not having to duplicate purchases or rentals via iTunes or Netflix. The following guide aims to show you how to stream Blu-ray to Apple TV, and then play BD movies on Apple TV in detailed steps. Click the blu-ray disc icon or blu-ray folder icon at the top-left corner of the main interface to import your bluray movie files, so as to streamBlu-ray to Apple TV for playback. Click the drop-down list of “Subtitle”, then all the subtitle info in the bluray will be shown clearly, including language and stream ID, which enables you to select your needed language as subtitles at will. In addition, Acrok Blu-ray to Apple TV Converter also offers an option called “Only show forced subtitles”, which enables you to see subtitle only when actors are speaking a different language. 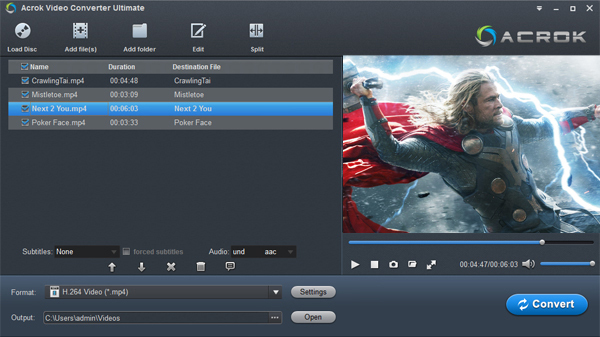 For instance, if you specify English (your mother tongue) as your subtitle, and meanwhile tick off “Only show force subtitle” option, then when actors are speaking English, no subtitles will show up, but when they are talking with each other in French, the English subtitle will appear accompanying with the French. The ability of selecting subtitle and audio track makes it possible for you to play Blu-ray movies on Apple TV in your own language. For the purpose of converting commercial Blu-ray movies to Apple TV for playback successfully, you need choose a format compatible with your Apple TV as output format. 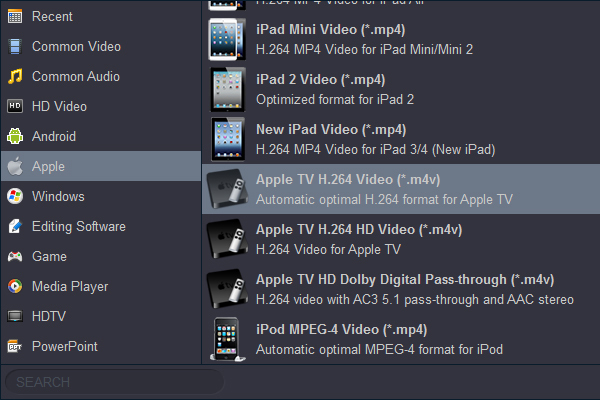 Click on the dropdown menu of “Format”, and then follow “Apple” > “H.264 Video (*.m4v)”. Acrok Blu-ray to Apple TV Converter allows users clicking “Settings” button to adjust audio and video parameters to optimize the output file quality. 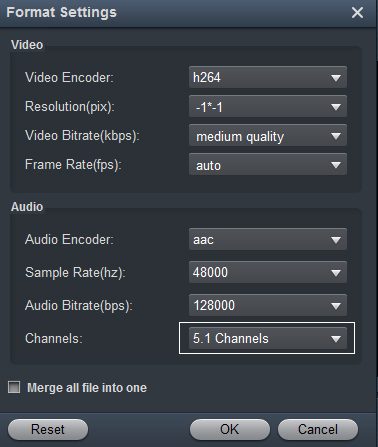 The adjustable settings include codec name, aspect ratio, bit rate, frame rate, sample rate and audio channel. To Stream Blu-ray to Apple TV for well playback, just use the following recommended settings. When the above mentioned 4 steps are finished, you can click the big button “Convert” to start ripping Blu-ray movies to Apple TV, Apple TV 2 and Apple TV 3 compatible file formats. When the Blu-ray ripping task is done, you are able to click “Open” button to get the final output files, and now you are ready to play Blu-ray movies on Apple TV with ease.